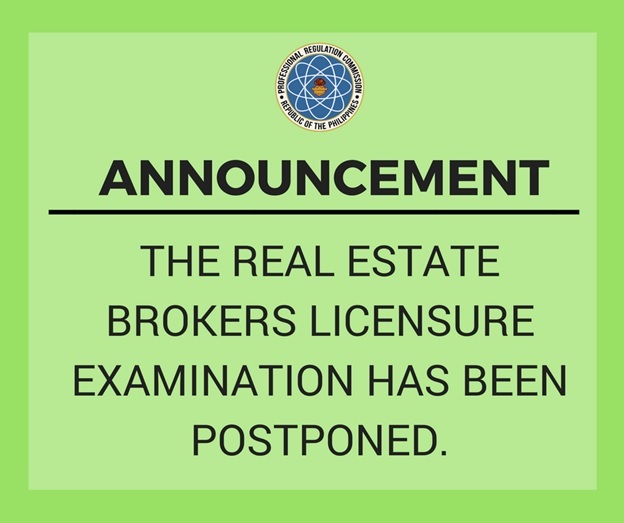 MANILA, Philippines – The June 2018 Real Estate Broker board exam has been postponed, the Professional Regulation Commission (PRC) announced on Monday, June 18. The deferral of the licensure exam is according to Resolution No. 1108, series of 2018, PRC said. The Real Estate Broker board exam was set on Sunday, June 17, 2018 in the cities of Manila, Baguio, Cagayan De Oro, Cebu, Davao, Iloilo, Legaspi, Lucena, Pagadian and Tuguegarao. The supposed Real Estate Broker exam this month tackles the following subjects: general/ fundamentals, special and technical knowledge and professional practice. The Summit Express will update this page immediately once new schedule is announced online. You may also visit the official website of PRC (prc.gov.ph) for more information.